Post-NFL combine mock draft roundup: Could a couple of former Huskies end up as Seahawks? Two UW defensive backs are rising up mock draft boards after solid performances at the NFL combine. And in general, mock drafters see the Seahawks leaning toward defense. 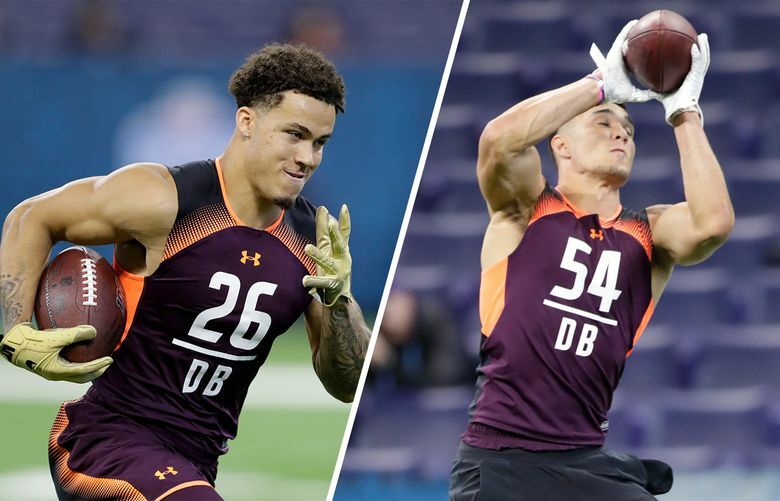 The NFL combine means, if not some major shuffling, at least some re-evaluating of draft prospects by coaches, general managers and scouts of NFL teams. And for those who try to predict how the NFL draft will fall, the end of the combine also means some reassessing of their own mock drafts. Here’s a compilation of 13 of the more popular mock drafts with their updated picks for the Seahawks following the combine, as well as my own comments (and yep, a couple of Huskies make an appearance). As a reminder, Seattle has the 21st selection in the first round — so all (or almost all) of these picks are the 21st overall in each of these mocks. Seattle also has just four picks overall, in the first, third, fourth and fifth rounds, having traded the others and not gotten any compensatory selections. THE PICK: Cornerback Greedy Williams, Louisiana State. MY COMMENT: To repeat every time Williams comes up — and as Edholm notes — Seattle hasn’t drafted a cornerback higher than the third round in the Pete Carroll/John Schneider era, with maybe their best picks at this spot coming in the fifth round or later (Richard Sherman, Tre Flowers, Byron Maxwell, Jeremy Lane). Williams also is being regarded a real boom-or-bust type, in part due to concerns about his run defense. Given all that, and the presence of Flowers and Shaquill Griffin as returning starters, this seems a little less likely of a pick to me than some others on this list. But if the Seahawks really think Williams is all that, then maybe they really will get Greedy. THE PICK: Defensive tackle Jeffery Simmons, Mississippi State. MY COMMENT: Seattle has taken some real chances in the draft the past few years with guys carrying medical or other risks, and some have paid off better than others. One of the whispered subplots of the draft last year was that Carroll was taking a little more control and wanted to take fewer injury risks, in particular. So Simmons makes a lot of sense as a player but the other stuff would make me think Seattle would be cautious, unless Simmons is a guy they think they can get by trading down some and acquiring other picks later in the draft. THE PICK: Defensive tackle Jerry Tillery, Notre Dame. MY COMMENT: Seattle can definitely use another DT to pair with Reed — Tillery played primarily the three-tech spot at Notre Dame, so in that sense he would be a perfect fit alongside Reed, with also some time at the nose and end positions. The big question might be if the Seahawks think he has the ability to be a three-down player. What to make of the Seahawks placing franchise tag on Frank Clark? THE PICK: Safety Taylor Rapp, Washington. MY COMMENT: Rapp said he met with the Seahawks. I don’t read much, if anything, into reports of visits — teams are going to use all 60 they get so they inevitably meet with just about everybody they can that might make sense. But Seattle has obvious reasons to be interested in Rapp. As I’ve written before, I think Seattle has confidence in young safeties Tedric Thompson and Delano Hill, but neither has yet shown definitively they are unquestioned budding stars the way Thomas and Kam Chancellor did by the second years of their careers. So Seattle could well look to add competition in the back end, especially with Thomas unquestionably now gone. THE PICK: Defensive lineman Ed Oliver, Houston. MY COMMENT: A lot of people still have Oliver as a potential top 10 choice, so if the Seahawks have him graded similarly then they might leap to the podium to make that pick. Oliver is viewed as being almost primarily a tackle at the next level, similar to Reed. But he also is viewed as a premier inside pass rusher, and any team can never have enough of those. And who knows? With Reed needing to be extended following the 2019 season, Seattle might want some options there just in case something were to go haywire in those negotiations. THE PICK: Defensive end Brian Burns, Florida State. MY COMMENT: I agree with Clayton — Seattle is likely to move down. Burns had a good combine but also still seems like a little bit of a projection, so it’s possible he could be there a little later, as Clayton suggests. Conversely, Burns weighing in at 249 at the combine compared to his listed 235 might mean he’ll be too enticing to pass up for teams before the late first. THE PICK: Alabama safety Deionte Thompon (but at No. 32 after a trade with New England). MY COMMENT: Easterling included trades in his mock and had the Seahawks dealing with New England to move down to 32 to allow the Patriots to take Iowa tight end Luke Hockenson at 21 — which makes all the sense in the world for both sides. With the extra picks, Easterling had Seattle acquiring, he gave them Wisconsin offensive tackle David Edwards at No. 64 and offensive lineman Ben Powers of Oklahoma at 97. He also gave Seattle cornerback Lonnie Johnson of Kentucky with its own pick in the third round at No. 84 (Johnson is the guy the Seahawks asked to engage in a staring contest at the combine) and then receiver Antoine Wesley of Texas Tech with its own pick at 124 in the fourth round. So a safety, two OLs, a cornerback and a receiver all in the first 124 picks for a team entering the draft with just four picks overall. Without knowing a ton about the latter two guys on that list, it sounds like a good haul on paper — and Wesley is listed at a hair over 6-4 and a big receiver makes a lot of sense for the Seahawks. THE PICK: Cornerback Byron Murphy, Washington. MY COMMENT: So, the usual caveats on the Seahawks and corners and the draft. But as Davis notes, Murphy’s weigh-in coupled with some good on-field drills appeared to move him solidly into the first round. Murphy didn’t play much in the slot at UW, which might be Seattle’s biggest cornerback need at the moment. But the Seahawks never are averse to changing someone’s position and role after drafting them and maybe they’d view Murphy as an answer there should free agent Justin Coleman — the starting nickel last year — get away. THE PICK: Safety Chauncey Gardner-Johnson, Florida. MY COMMENT: Some view Gardner-Johnson as having the ability to play both safety spots as well as nickel corner (he measured 5-11, 210 at the combine). If so, he could be really attractive to Seattle as a player they could throw into the competition all over the secondary. His 4.48 40 at the combine also doesn’t hurt. THE PICK: Tight end T.J. Hockenson, Iowa. MY COMMENT: Tight end doesn’t feel like Seattle’s biggest need. Conversely, Hockenson is viewed as potentially a real difference-maker on offense and Seattle can use all the playmakers in the passing game it can get. Seattle could also save $3.5 million against the cap if it made Ed Dickson a post-June 1 cut with just an $866,666 dead cap number. Something to think about anyway. MY COMMENT: Another vote for Hockenson. I don’t know how much Seattle has missed Graham necessarily, but the fact that Hockenson also is viewed as a plus blocker could make him a real consideration. MY COMMENT: And one more vote for Hockenson. MY COMMENT: As noted there, size is going to be the question with Burns, but the 249 at the combine helps him.